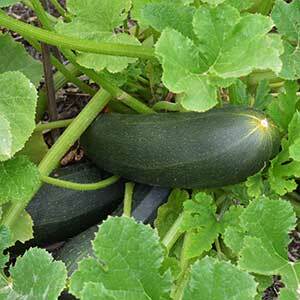 One of the easiest vegetables to grow is the humble Zucchini. They are very productive, can be grown from seeds or seedlings and you can grow them in the vegetable garden or in a container. Most varieties will need to be planted at around 70 – 90 cm apart. These are a frost tender vegetable and they are best planted once the soil has warmed up in spring. They take around 8 weeks from seedling to harvest, and are best picked before they grow to big. Prepare the soil well before planting. Weed the area, dig in some well rotted compost and some blood and bone. Seedlings can be planted directly as soon as the weather warms. A soil temperature of around 20C works well. Seeds should be planted into trays of jiffy pots 4-6 weeks before planting time. Grow them on in a warm sheltered position, a cold frame, indoors or a hothouse. Planting distance is important as this allows good airflow and will help prevent fungal diseases. It also allows for better growth. After planting the seedlings, mulch around the plants to maintain moisture. Water regularly and fertilise with a liquid seaweed fertiliser, seamungus or dynamic lifter. Why grow them from seeds in trays? This method of propagation allows them to be grown in a warmer position, it also allows them to get to a good size before planting out. This stops the snails from eating the very young seedlings. 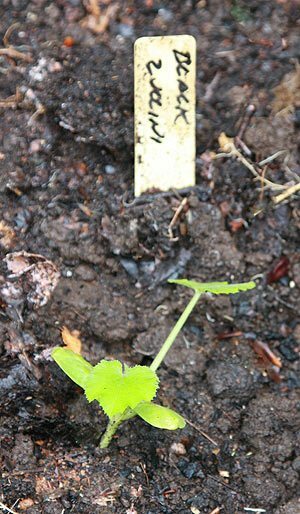 Like pumpkins, if you have a compost bin and put Zucchini seeds in you will usually get self sown varieties, however germination from seed is fairly easy as well. We sow seeds in individual ‘jiffy pots’, indoors in early to mid spring. Seeds are planted at around 3cm deep and will germinate in 14 days. The seedlings are ready to plant out two or three weeks after this. In Cool Temperate Zones (Tasmania and cooler areas of Victoria such as the foothills) plant in October. Try to harvest the fruits are around 15 cm long or shorter. The longer and older the get, the tougher and less tasty they become. The flowers can be eaten as well, so look for the male flowers, these are the ones without the little ‘zucchini bulge’ just below the flower itself. They will take around 2 months to produce a good sized fruit. Solving Zucchini problems and general care. Powdery Mildew is one of the main problems and this is caused by humidity, so try to water in the morning and give the foliage time to dry out before night. You can try to water the base of the plant rather than overhead watering. Lots of organic sprays are available to combat powdery mildew, or just snip off the affected leaves if its one or two. A diluted milk solution 1 part milk to 9 parts water. Fruit not forming. Often this is because plants are to close together, lack of light. It can also be lack of pollination, no bees and insects mean no pollination, however a little paintbrush can be used to hand pollinate. Or just pick the male flowers and rub them together with the female flowers. Avoid overhead watering, this can cause flower rot, use a soaker hose instead. We owe a lot to the plants of the Incas and South America in general and the humble Zucchini is one of them. These are an easy care productive and fast growing plant. They will grow in most climates as long as the soil is warm. Growing season will vary depending on the climate and the year, some years are colder or warmer. In Australia they can be planted in Tasmania in November to December and in Queensland almost year round. In Melbourne we plant ours out in mid to late October depending on the season. In frost prone areas wait until the frosts are over, they are a plant that does not like frosts. If you are wanting to save your own seeds you need to let one or more fruits stay on the plant until it matures. Open up the Zucchini and remove the seeds. Wash them in a sieve or colander to remove all of the pulp. The seeds then need to be dried. Spread them on a tray and store them in dry position, warm but not hot. Turn the seeds regularly and remove any that show signs of rot, mould or are damaged. ‘Tromboncino’, this one grows as a vine with long fruit and a ‘bulbous’ end. It will need a trellis or similar. ‘Blackjack’ is a popular and commonly grown variety. ‘Costata’ is a ribbed variety, excellent for stir fries and grilling. ‘Blanco Lungo Cylindrico’ is a fairly easy growing green variety, a heavy and long cropping variety. ‘Ronde de Nice’ is a French variety with rounded fruits. 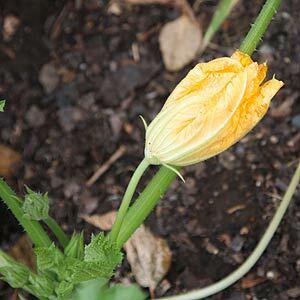 ‘Zucchini Golden’ has yellow fruits, and with literally dozens more the choice is generally related to color, Green Black or Yellow. You can use them in wide range of Mediterranean style dishes including the Ratatouille. A very easy way to cook Zucchinis is to slice them longways, rub them with olive oil and some Moroccan spices and grill them on a BBQ. They can be planted alongside Sweet Corn, Tomatoes, Spinach and Silverbeet. They also grow well when planted with nasturtiums. 1 Can of peeled tomatoes. Coarsely dice the onion and toss it in a large frying pan with some olive oil. Chop the Red capsicums roughly and add them to the onions. Dice the Zucchini (not to small) and add it to the pan. Dice the eggplant and add to the pan. Crush the garlic and add it to the pan along with the canned tomatoes. Stir well and reduce the heat to a slow simmer. Cover the pan with a lid. Cook for a further 20 minutes and then check for flavour and consistency. If need cook for a little longer. Try a search for ‘Zucchini Flowers Stuffed with Ricotta, Spinach, & Prosciutto’, this is a great favorite of ours.